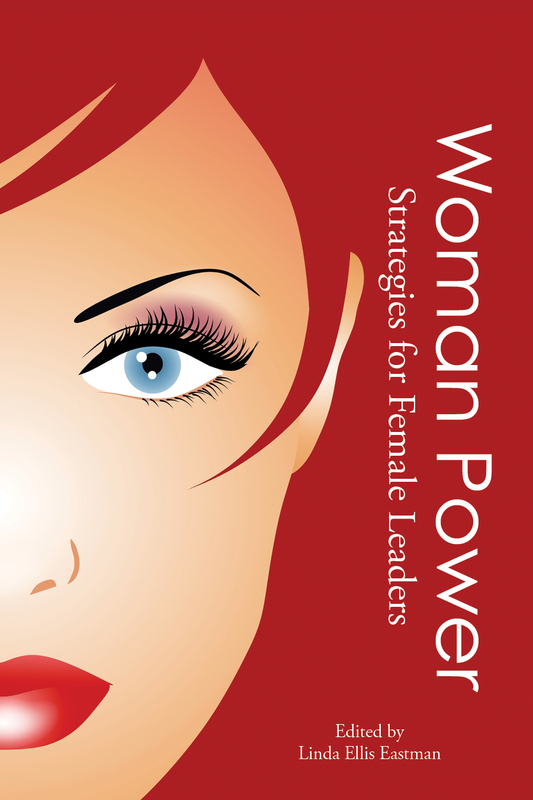 packed, supply of my book ‘Woman Power: Strategies for Female Leaders’ appealing to be signed, including one for the lucky winner and ready to help women entrepreneurs ‘see’ what’s possible when you know how…. 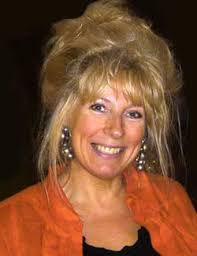 Treats and fun in store tomorrow in my ‘Because I’m worth it Magic Formula’ workshop in Hawthorne 2 from 3.45 – 4.15 pm at Lincolnshire Women’s Enterprise Day Belton Woods, Grantham, UK. Change is the ONLY was to be, do, have what you REALLY want. Yes! I’ll take you out of your Comfort Zone, just a little,but you are in safe hands and you will never look back! 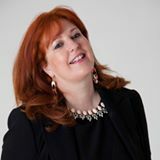 Michele Walsh, AKA MsMoneymaker.com Money Coach, Workshop Facilitator and Speaker , Author of Forthcoming Book…. 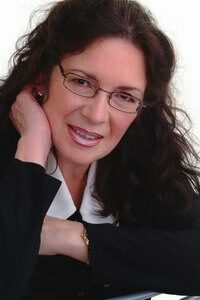 After only our first session Michele said– “Hi Valerie, Just a quick email whilst I catch my breath. I have been full on manifesting and creating paths to my new VitalVision™ like you wouldn’t believe. STOP PRESS! Latest New Workshop Added to Lincolnshire’s Women’s Enterprise Day Conference 17th November 2015 at Belton Woods, Grantham UK. What is Success? What does it mean and look like? Why is Success important to you? So what’s blocking you from getting the Abundance and Success in your Life and Business that you REALLY want? Not sure? Then come and find out. In just 45 minutes your outlook will positively change! AND many, many more successful women entrepreneurs . Short explanation of what workshop will include. Come with an Open Mind and discover the detail of the Female Entrepreneur’s Magic Formula for Abundance and Success in the Life and Business that You REALLY Want and How to Work It for You. Interactive session showing how to get unstuck, unblocked, overcome obstacles or simply push further forward with your current success on a higher level. Learn How to work the holistic Magic Formula in your life AND your business, now and any time in the future. Opportunity to step up and state your Business Challenge/Block/Unfulfilled Business Ambition and gain some forward movement in a friendly and supportive group. Handouts to help you when you take this discovery and learning away from the Conference. I’m SOOO excited! 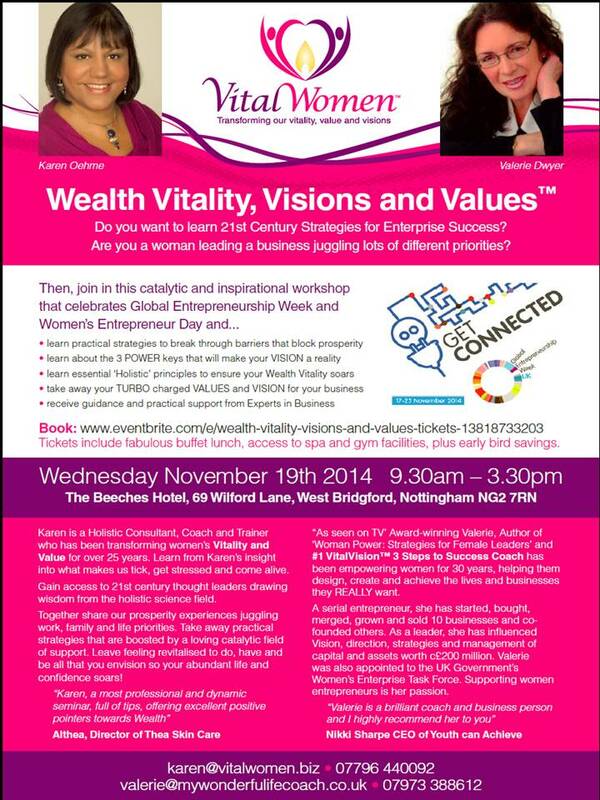 Together with Karen Oehme, #Values Guru and Founder of Vital Women™ we have developed this Wealth Vitality, Visions and Values™ Event supporting GEWUK on UK Women Entrepreneur’s Day, Wednesday 19th November 2014. Book Now for early bird savings on an unmissable event CHANGE YOUR LIFE! beginning on19th November 2014. Save and share the date – 19th November 2014 is UK Women Entrepreneur’s Day – part of GEW -Global Entrepreneurship Week 17-23 November 2014. Come and join us in a day you will never forget for all the right reasons. Do you want to learn 21st Century Strategies for Enterprise Success? 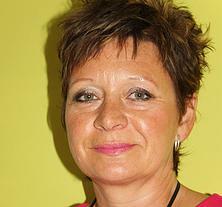 Are you a woman leading a business juggling lots of different priorities? Tickets include fabulous buffet lunch, access to spa and gym facilities, plus early bird savings. The Beeches Hotel, 69 Wilford Lane, West Bridgford, Nottingham NG2 7RN – Plentiful FREE parking, delicious buffet lunch and use of SPA all included! Benefit from the wealth of holistic and entrepreneurial experience spanning over 55 years and 12 businesses when combined.